Posted July 25, 2009 by Catherine Winters & filed under Blogathon 2009, Blogosphere, Brands, Catherine, Media, Memes, Omega Point, Pop Culture, Typography, Video. So I’m working on a single-serving site to finally make use of my other domain. Functionally, it’ll be a business card of sorts, featuring a more coherent bio, with links to the various ways I can be contacted online. Ultimately, I suspect I’ll roll this site into it. Anyway, while the art style I’m using is very, very different than this, both use a nice slab serif typeface called Rockwell. While selecting it, I came across this this video I liked from a couple years ago: the “Say ‘what’ again. I dare you.” scene from Pulp Fiction, in type form. Posted July 25, 2009 by Catherine Winters & filed under Blogathon 2009, Blogosphere, Web 2.0, WordPress. Posted July 25, 2009 by Catherine Winters & filed under Blogathon 2009, Catherine, Cute. I spent so much time playing Lemmings when I was younger. What an awesome game. June of PlanetJune has included crochet patterns and suggestions for accessories on her blog. 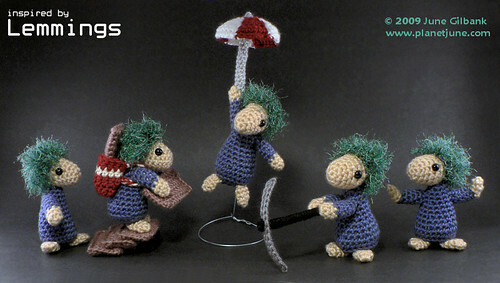 And to crocheters out there: what better than crocheted Lemmings to go with my Weighted Companion Cube? I mean, really. Posted July 25, 2009 by Catherine Winters & filed under Blogathon 2009, Brands, Catherine. 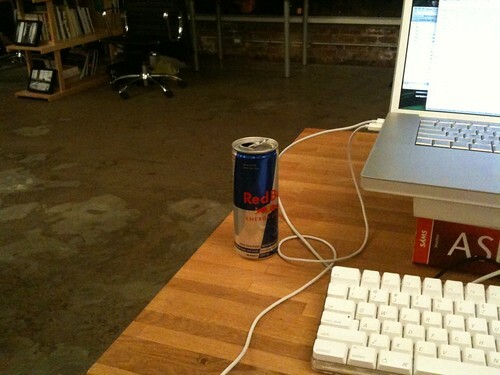 When I worked at the Great Northern Way Campus, there existed an unwritten but very official decree: under no circumstances was anyone to allow me to have any Red Bull. So… yeah, we’ll see how that goes tonight. Posted July 25, 2009 by Catherine Winters & filed under Blogathon 2009, Blogosphere, Catherine, Omega Point, Web 2.0. Posted July 25, 2009 by Catherine Winters & filed under Blogathon 2009, Catherine, Cycling, Exercise, Vancouver. So I deliberately brought my bike to Workspace this morning, knowing that if I was lagging this evening, I could go for a nice endorphin-boosting ride up and down Waterfront Road, across the tracks from Gastown. I really can’t say that I was expecting a massive thunderstorm instead. In retrospect, I wish I’d taken the bus, letting me get in another post about how the #8 bus is crazy and how it was much better when my MLA drove me to work every day. Sadly, it was not to be. I have to say, I’ve never seen a thunderstorm like this in Vancouver. From the streams coming up on Twitter, it doesn’t appear to be stopping the fireworks in English Bay though, so if they can press on, so can we! Posted July 25, 2009 by Catherine Winters & filed under Blogathon 2009, Blogosphere, Brands, Canada, Law, Media, News, Politics, Privacy, Vancouver, Web 2.0. Posted July 25, 2009 by Catherine Winters & filed under Blogathon 2009, Blogosphere, Canada, Media, News, Vancouver, Web 2.0. Dave Olsen stopped by Workspace this evening to cheer some of us on and tell us a bit about the social/indie/citizen media project he’s working on for the 2010 Olympics this year, the True North Media House. We intend to create a space in downtown Vancouver to serve as a media resource centre with high-speed internet, audio and video production facilities, green screen and interview space, press conference space and workstations. This project was launched by a group of media makers who covered the past several Olympic Games as un-accredited media. The organization has grown into a extensive group of volunteers from various industries and bringing diverse skills and motivations to the project. Nice, right? Dave notes that they’ve been careful to identify as a group distinct from anti-Olympic protestors as well as the IOC itself. He says that his interest is in finding the stories the mainstream media can’t or doesn’t cover. He wants to make friends with people from other countries, hang out with them and enjoy a game or two: this is what breaks down the differences between us and makes it hard to hate people from “over there”, wherever that may be. And he’s right. Studies demonstrate residing in large, diverse cities, or international travel — even religious pilgrimage — increases tolerance, respect and understanding for people lucky enough to be able to make the trip. And isn’t that what the Olympics are supposed to be about? Unlike a few friends and bloggers, I’m not a huge sports fan myself. At the same time, I’ve been known to enjoy watching a game, taking in an event. But it’s the stories Dave’s interested in telling that are most interesting to me. And that’s why I’m going to go to the next TNMH meeting. Posted July 25, 2009 by Catherine Winters & filed under Blogathon 2009, Vancouver. Last year, I was working as a web developer for the Masters of Digital Media program at the Great Northern Way Campus here in Vancouver. Having left, I want to apologize for something I did while I was there. MDM students, remember how I told a bunch of you that I had a key that led into the basement of the Centre for Digital Media, a converted Finning Tractor factory? And how I told you students weren’t allowed in there? And remember how a bunch of you really, really wanted to go? And tried to talk me into it? 1. Heavy mining equipment and basements don’t mix. 2. Neither does landfill 6 feet above see level. Posted July 25, 2009 by Catherine Winters & filed under Blogathon 2009, Catherine, Vancouver. Unexpectedly, it seems that the lower mainland is getting a bit of rain today! “Chance of cloud” in Vancouver turned into thundershowers in the Fraser Valley. There’s already been a couple lightning strikes in the PoCo area, by the sound of the thunder. I love how a thunderstrike brings up multiple “Wow, lightning! Did you hear that?” entries on IM and Twitter. Now, I like to travel with a variety of equipment. Extra power cord, towel, etc. Today, I may have brought more than is typical. Yeah, I like to pick what I say for its maximum potential in making people feel totally comfortable with the way the conversation is going. You’d think I would’ve included an umbrella.